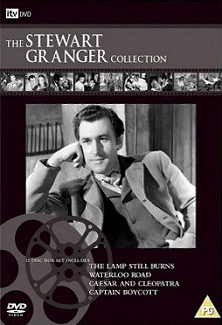 The Stewart Granger Collection DVD. 12 disc box set includes The Lamp Still Burns, Waterloo Road, Caesar and Cleopatra, and Captain Boycott. Of all the British film greats to emerge from the late 1930s, none made such a lasting impact on the costume drama, epic adventure or melodramatic tear-jerker than Stewart Granger. Acting was in the family's heritage - Granger's grandfather was the celebrated stage tragedian, Luigi Leblanche. It was prophetic that he would inherit his grandfather's dashing good looks, confident acting style and name. Born James Leblanche Stewart in London on 6th May 1913, his first professional ambition was a career in medicine, but hastily decided it wasn't the life for him and left before completing his preparatory studies. Bewitched by tales of his famous relation, he decided to cement a blossoming interest in acting. Featuring: Love Story (1944), The Lamp Still Burns (1943), Madonna of the Seven Moons (1944), Fanny by Gaslight (1944), Caesar and Cleopatra (1945), Waterloo Road (1945), The Magic Bow (1946), Caravan (1946), Blanche Fury (1948), Captain Boycott (1947), Adam and Evelyne (1949), Woman Hater (1949).